We know that Windows Phone 8 will not be coming to any of the existing Windows Phone handsets, which is a pretty awkward situation for current WP handset owners. This leaves the current Windows Phone community in a dilemma, but we also heard somewhere that a few high-end smartphones might just get lucky. 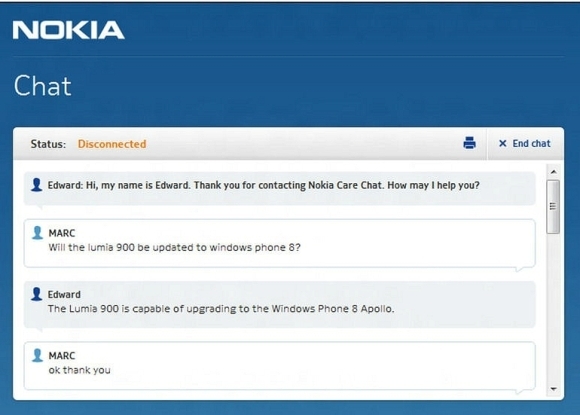 The news comes from a Nokia Care representative, who in a chat confirms that the new upgrade might just arrive for the Lumia 900 smartphone. Now we aren’t very sure if the update is actually arriving as we just can’t trust someone from Nokia Care making such huge claims. But we really hope that it does.